Quantity: 200 pieces (40 pieces of each color). The size of the die-cuts was from 1” x 2” to 2” X 2.5”. 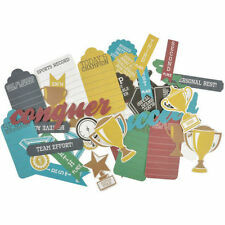 (Ideal for scrapbooking and card making accents as well as decorations, table confetti and other paper crafts. 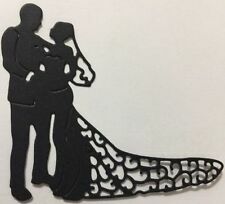 Cut with a Cricut cutting machine. Request a quote.). with CRICUT. 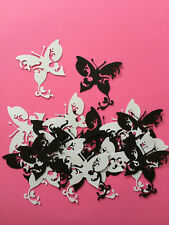 (Ideal for scrapbooking and card making accents as well as decorations and other paper crafts. in 5 Styles and 5 Colours. Request a quote.). Cut with a Cricut cutting machine. 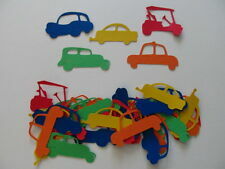 30 Car Die-cuts. These estimates are quite accurate in my experience to date. Crafts, paper crafts or other cute decorative ideas. Football Card Making Toppers. Kids Paper Craft Supplies. would be great for card making, scrap booking, kids. quality black and white card. Once the order has been. I use ACID Free Products. Machine Cut. (40 Onepiece Diecuts. 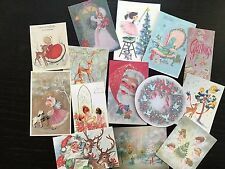 Ideal for scrapbooking, cardmaking accents, baby shower invitations/decorations and other paper crafts. Cut with a CRICUT cutting system. Request a quote.). These estimates are quite accurate in my experience to date. Large oval: Approx.10 6.3cm/3.94" 2.48". Small oval: Approx.3.8 5.2cm/1.50" 2.05". Material: Carbon steel. Color: Silver. If item is defective after 3 months, you can still send it back to us. We will send you a new one after receiving the defective item. Nous vous prions de nous excuser pour tout le retard des réponses pendant les vacances. Large oval: Approx.10 6.3cm/3.94" 2.48". Small oval: Approx.3.8 5.2cm/1.50" 2.05". Quantity: 2 Pcs(1 Set). If item is defective after 3 months, you can still send it back to us. Color:As picture. Use:Fantastic design for your invitations/ cards/ envelopes. Color:mixed as picture shows. Use:Fantastic design for your invitations/ cards/ envelopes. 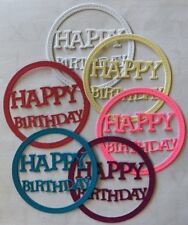 These diecuts are ideal for scrapbooking and cardmaking accents as well as for party decorations and other paper crafts. Cut with a CRICUT cutting system. These estimates are quite accurate in my experience to date. (40 Yellow Rubber Duckie Diecuts. Ideal for scrapbooking, cardmaking accents, baby shower invitations/decorations and other paper crafts. Cut with a CRICUT cutting system. Request a quote.). These estimates are quite accurate in my experience to date. Color: Lt. Blue, Purple, Pink, Hot Pink. Quantity: 100 pieces (25 pieces of each color). Condition: 100% NEW in good quality. Am 13.03.19 hat der Verkäufer die folgenden Angaben hinzugefügt Use:Fantastic design for your invitations/cards/envelopes. Color:As picture. 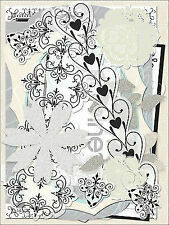 Use:Great idea for your scrapbooking/card making projects. Felt Die Cut Leaves x 16. 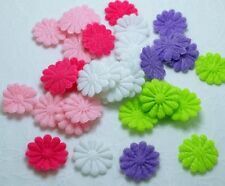 Cut from High Quality Smooth acrylic craft felt. You will receive 8 white and 8 grey leaves. you may use the colour chart. washable at 30 degrees. Easy to glue or sew. YOU WILL RECEIVE 4 STORKS WITH PINK BUNDLES. 4 X MINI STORKS WITH PINK BUNDLE DIE CUTS. 6 x SWIRLY OCTOPUS DIE CUTS. Not what you are after?. It will go in a Card Envelope or a Poly bag. Machine Cut. Info of diecut: Layered (Ready to use). 12 x LEAF DIE CUTS. YOU WILL RECEIVE THE 6 SETS OF THE LEAVES SHOWN IN THE PHOTO ABOVE.